Book provided by publisher for review. All opinions are my own. We have just harvested the few corn plants we planted in the backyard. It was really fun to work as a family, planting from seeds, growing in small trays, replanting in the yard, watering and checking progress. Finally, they were big enough for us to eat and they nice brown silk on top! So much fun to rip off the husks, boil them, and slather with butter. So nice to see that in this book the family experience we had with our corn was also present. The boy and girl making corn tamalitos stuffed with cheese have such an amazingly good time, it's infectious. I've never really thought about how physical cooking is, but this book has made me realize that it is kind of like a dance, with the music provided by whistling kettles, banging pot lids, and general kitchen ruckus. How can you not have fun with a dancing chef? Plus, as you know, I'm a fan in general of stuffed foods. Corn has a long history, and as a staple of many cultures, and Argueta is able to bring in a lot of that in an engaging way. We got out our globe and looked for the countries mentioned, we looked up tamalitos and masa and all the other ingredients we don't know. Plus we got to compare and contrast to a traditional confection from our part of Japan, akumaki, which is made in a similar way but with a bamboo skin rather than corn husks, with this traditional Salvadoran fare. This is pretty much the perfect social studies lesson! Argueta originally wrote this in Spanish, and unfortunarely I can't read that part with any sort of authenticity! But the translator, Elisa Amado, has done an amazing job of rendering this verse into playful English that makes you want to eat and dance! Domis colourful watercolour illustrations are bright and cheerful and reflect all the colours of the many different kinds of corn. This is the most cheerful recipe book I have every read, and we were very happy to see that this is part of a series. 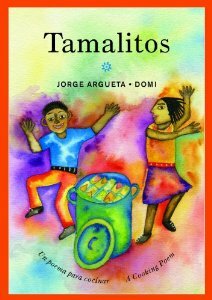 The other bilingual cooking poems include Guacamole, Bean Soup and Rice Pudding (I need this, don't you? ).